I do hope you all enjoy my forays down history lane as much as I enjoy digging up old pictures and sharing them with you. I figure if the Library of Congress took so much time and effort to create digital collections, it would be a waste to let them sit online undiscovered. Today, I’m taking a look at the early years of bottle-feeding. When I saw this picture of a nurse teaching this black mom and her daughter how to properly fix a baby’s bottle it occurred to me that black moms’ current reliance on formula is purely economic in scope and has always been. 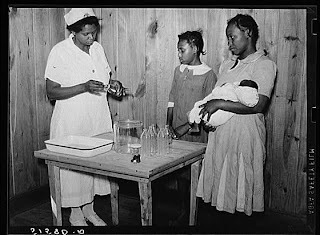 The caption to this picture reads: Nurse Shamburg demonstrates care of baby bottles to Mrs. Paralee Coleman and Marie. Mothers have to work in field and children are left at home to care for babies. Health clinic, Gee’s Bend, Alabama. It was taken in May of 1939. Formula made it convenient for women to go right back to work and made it possible for their older children to take care of the babies. 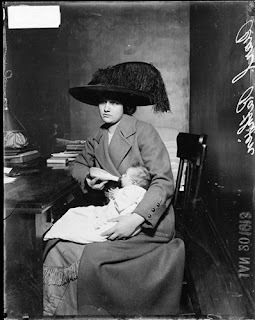 But, now look at this photograph of a white aristocratic mother taken on January 20, 1913. Here, formula-feeding has nothing to do with economics, or probably even going back to work for her. Instead it’s all about prestige and liberation. This is a Three-quarter length portrait of Pearl Rathjen, dressed in a coat and hat, sitting at a desk in a room in Chicago, Illinois. She is holding a baby on her lap, and feeding the baby a bottle. I suspect that from the early twentieth century when formula was generally intended for the rich (like in the picture above), it soon became a standard practice by the late 1930s and 40s for even the poor. 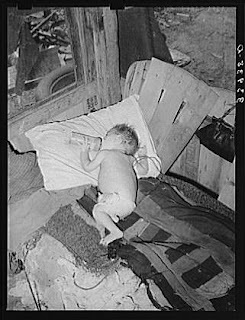 This is a baby with his bottle in shack home near Mays Avenue camp. Oklahoma City, Oklahoma, taken in July 1939. At least life for breastfeeding mothers has gotten a lot better. After all, we at least have lactation consultants in the hospitals who can help us nurse properly and who espouse the benefits of breastfeeding. It sure beats a whole team of nurses whose sole job is to mix formula. Nurse training. 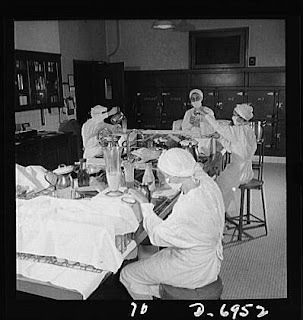 In a hospital’s formula kitchen, student nurses prepare dozens of bottles for dozens of babies. Each set of bottles contains different amounts and is made up of various ingredients. Formula is made up once a day, and bottles are labeled and kept in the refrigerator until needed. This picture was taken in November 1942. Can you believe they had a formula kitchen? Now we just have goody bags with free formula samples in them. Now that I think about it, I’m not so sure we’ve made any progress at all.